I’ve tried to make my peace with what is known as “The New Vulgarity”, as Hollywood has jumped on the R-rated comedy bandwagon, but it isn’t always easy. Luckily enough, Sean William Scott (a.k.a “The Stiffmeister) gives it his best as a hockey player whose main function is to beat up the players on the other team. Silly right? But believe it or not, the film is based on a true story, chronicled in the book “Goon: The True Story of an Unlikely Journey into a Minor Hockey League” (sounds like a good book to me). Doug Smith’s true story is slightly fictionalized in the movie, but its heart is still the same. I’m no hockey expert, but apparently, hockey fans agree that the game is not entertaining enough until there’s blood on the ice. It’s a tradition, and it’s up to the “Goon” to make that happen. Why the nickname “Goon” you may wonder? Because he can’t play hockey. Because he can barely skate. But that’s fine. Doug’s not paid to play hockey here. He’s paid to beat people up. And he’s damn good at it.The film is harsh, bloody and extremely vulgar. But it’s also very funny at times, which makes me wonder how much (if anything) would have been lost if it had been toned down a bit. Would audiences have complained that it wasn’t edgy enough? Might it have suffered in comparison to other extreme comedies? I’m not really sure. 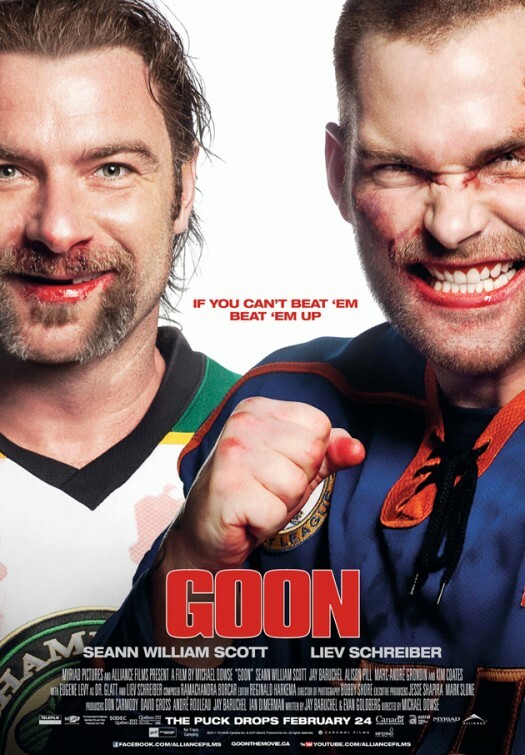 But I do know this: “Goon” might seem like hokum if it weren’t based on a true story.